On this day in 1999 Hillgrove Farm, the notorious breeder of cats for vivisection, closed down following a bitterly fought campaign which had been the focus of protests since 1997. The animals, due to be sold to laboratories for experimentation, were transported in a fleet of 16 vans by 33 RSPCA officers to a cattery where they were vaccinated and microchipped by vets and then distributed to RSPCA animal centres across the country. Chris Lawrence, the society’s chief vet, said: “Our aim now is to provide a brighter future for these animals by finding loving new homes for each one. We are appealing to anyone thinking of taking a cat to consider an RSPCA cat.” Newspapers gave a hotline for rehoming the animals, all of whom were also neutered. Christopher Brown, who ran Hillgrove for 30 years with his wife Katherine, denied that the campaign was the reason for him quitting. He said: “Their actions merely encouraged me to stay on. However, having reached the age of 61, I feel it is the right time to retire from the business and run the arable side of the farm for a few years to come. He added, however, that his car had been “firebombed”, his house “burnt” and the windows “broken on many occasions”. He also claimed he was beaten up and said his wife and staff had been “attacked”. In context: Hillgrove Farm had been a target for decades. In 1981 ten activists were sentenced to six months suspended for two years and fines totalling £1400 for breaking into the units. From 1994-96 an undercover investigation by the National Anti-Vivisection Society found cats sold to the Institute of Neurology and Charing Cross Medical School were kept in bare rooms with no bedding and used in horrific experiments which included cutting or crushing their spinal nerves and damaging various nerves with diphtheria toxin. In January 1997, during Barry Horne’s first hunger strike, sheds containing cats were broken into and 14 cats removed by activists during a protest. Unfortunately nine were recaptured by police but the rest were taken to loving homes. Six people are arrested and charged with burglary in connection with this action but it didn’t stop the liberation of another 20 cats in a return visit. Meanwhile Gregg Avery and Heather Nicholson had set up a grassroots antivivisection campaign against Consort Beagles. After two national demonstrations and protests against its directors, this family business closed down in July 1997. Gregg and Natasha then launched Save the HIllgrove Cats (SHC). They took Consort’s momentum into SHC by building a truly national campaign. Hillgrove Campaign Issue 1 reported the first national demo in September 1997 as “the biggest to date…activists from as far afield as Newcastle and Shoreham… numbered 300 with local supporters swelling our ranks.” Later that day a group of 100 people went to the homes of Hillgrove workers – such “home visits” became key to the struggle. National demonstrations went on every month. 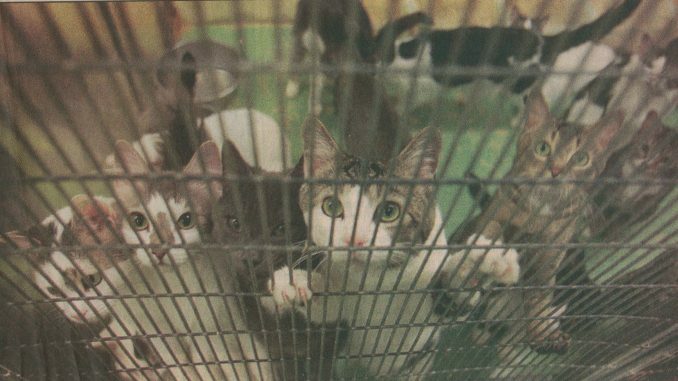 At World Day for Laboratory Animals in April 1998 about 1500 protesters turned up to discover a massive fence had been erected around the cattery. There followed something akin to a medieval siege as people tried to tear it down, while others vented their anger on Brown’s cottage by breaking its windows and roof tiles with stones. A five mile exclusion zone was then thrown around Hillgrove, with the backing of home secretary Jack Straw and enforced by Thames Valley Police, one of whose officers told a protester: “This is it. Your demonstrations are finished.” Far from it, the national demos went ahead instead in Oxford, against the University’s department of psychology which used cats from Hillgrove, causing traffic chaos. In late 1998 Brown was quoted in the Independent as saying: ‘Financially it’s been a disaster, devastating. We’re existing, not living. And you can only withstand so much. I just wish I could see a future. After a demonstration in Oxford city centre that was hemmed in by police caused mayhem, traders complained they had lost a fortune in pre-Christmas takings. At a meeting with SHC in February 1999, Thames Valley Police agreed to suspend the exclusion zone and the next national demo a few days later took place at the Farm. Brown’s heart must have sunk when he saw people just outside his house; by this point he’d said publicly that he would step aside if he was given £200,000 in compensation. In between the big national protests there were regional days of action every Saturday with campaigners from the midlands, south east and London, south west, Wales and even as far away as Scotland turning up to voice their anger. By summer 1999 there were rumours that Brown had had enough. Where once he’d been cocky and defiant, now he was morose and subdued. Little wonder given he’d been kept awake by fireworks, telephoned thousands of times, received numerous black faxes, tons of junk mail, hate mail and hundreds of unwanted items like plates, books, compact discs, etc. Night visits saw his telephone pole chopped down and windows smashed many times. Many workers resigned after demos at their homes and also having their cars and windows damaged. The end when it came seemed inevitable but was greeted with joyous relief. Many of us remember where we were when we heard Hillgrove Farm was over. The struggle had been a long and hard one, the like of which the AR movement had not seen before. There were hundreds of protests, from small numbers of people outside the front gates to national demos that attracted over 1000 supporters. Over 350 people were arrested, 21 imprisoned and policing costs totalled £2.8m. We know for a fact that similar places to Hillgrove are shaking in their shoes wondering if they are next. You will find out soon enough where that place is. We hope you want to be part of a third victory however long it takes. The animals don’t have a single day to lose. They are dying now. SSM was the same mix of demos such as greeting workers, all night vigils and large national actions. The first of these in November 1998 drew 800 people “in a noisy national protest”. Local residents joined campaigners from across the country. Many activists got into the fields surrounding Shamrock and there were five arrests. Horrified they were. Especially as the successor to Hillgrove was Huntingdon Life Science, the largest contract testing laboratory in Europe. Stop Huntingdon Animal Cruelty (SHAC) predicted HLS would be finished in three years. Early on it was astonishingly successful and in January 2001 HLS almost went bust, saved only by the last minute intervention of New Labour science minister Lord Sainsbury who brokered a deal with an American investment firm. In 2004 yet another high profile group emerged, Speak. It opposed a new laboratory planned at Oxford University and in July the contractor building the lab quit after receiving threats. For 18 months the site lay derelict and it was reported that investment in companies carrying out animal testing had fallen by about £100m. Bosses of leading drug manufacturers met prime minister Tony Blair with warnings they might relocate overseas where the climate was less hostile. Whereas the government had previously reacted in a piecemeal fashion, now it went on the offensive, setting up the National Extremism Tactical Coordination Unit and the National Domestic Extremism Team to counter “animal rights extremism”. New laws targeting campaigners were introduced and the first arrests were of SHAC activists occupying a company’s offices. The government also announced funding of up to £100m for the building of the Oxford laboratory. By this point the Halls were teetering on the brink. They had withstood years of obscene and threatening phone calls, letters and emails, fireworks set off outside their homes in the night and graffiti sprayed on their property, as well as being ostracised from their own community, including their golf club! All that was required was one more blow and in October 2004 the remains of Christopher Hall’s mother-in-law, Gladys Hammond, were taken from her grave. In August 2005 the Halls closed their farm and their opponents held a victory march. In May 2006 Gladys Hammond’s remains were recovered. The following week four activists were convicted of conspiracy to blackmail. Three received 12 years each, the other four years. Some Newchurch activists joined a new group against Sequani, a laboratory in Ledbury, but 12 members of this group were arrested under the new laws and the campaign never recovered. Exactly one year later it was SHAC’s turn – a massive police onslaught called Operation Achilles led to 32 arrests and 13 people were sentenced to up to 11 years. Grassroots antivivisectionism wasn’t quite over. There were new initiatives against lab animal breeders but they floundered in the face of repression and low morale. SHAC carried on until 2014. Since then there have been no more campaigns like it but we should not forget the decade from 1997-2007 for it was indeed a remarkable era when the animal testing industry was shaken to its core by ordinary compassionate people.